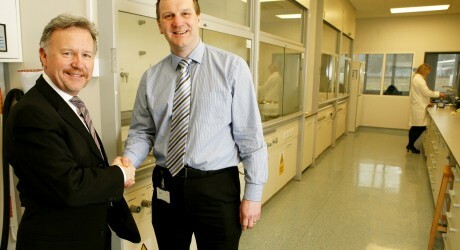 A NEW, bio-inspired materials science company, spun out from the University of Strathclyde by Dr David Lightbody and Professor Rein Ulijn, is the newest business to locate at BioCity Scotland. Biogelx has located to BioCity Scotland, which opened just over 12 months ago and provides a state-of-the-art bioscience facility to small and growing life science ventures. It offers flexible space with well-equipped lab and office accommodation. Close to the M8 corridor in Central Scotland at Newhouse, BioCity Scotland provides 130,000 sq ft of high-quality pharma laboratories and office space. The facility is home to a fast-growing group of dynamic science businesses who have the opportunity to network and collaborate with each other, as well as access to first-class support services provided by BioCity Scotland. Fraser Black, managing director of BioCity Scotland, says: “Our environment gives bioscience businesses maximum chance of success for their investment. Last month, BioCity Scotland was awarded the contract to run the Screening Centre for the European Lead Factory, announced by the Innovative Medicines Initiative (IMI), which will bring £16 million of drug discovery research funding to Scotland. Biogelx is developing a collection of leading edge tuneable peptide hydrogels. These are patented, market ready, in vitro hydrogels, for applications in cell culture research, toxicology screening and patient specific therapy development. The gels mimic natural tissue, giving them a wide range of possible applications from use in toxicology, to cancer biopsy, and create an opportunity to reduce animal testing in drug therapy development. The firm has attracted start-up funding through a Scottish Enterprise SMART award, funding from Gabriel, a new Glasgow-based angel investment syndicate and the Scottish Investment Bank. MEDIA RELEASE posted by The Business PR. You too can post media releases (aka press releases) on allmediascotland.com. For more information, email here.